Around 244 million years ago, sails were a major fashion trend. No less than three extinct crocodile cousins found in different parts of the world – Arizonasaurus from the southwestern United States, Xilousuchus from China, and Ctenosauriscus from Germany – walked across the early Triassic landscape with prominent billboards of flesh and bone on their backs. This was not just a bizarre twist in evolutionary history. Together, these creatures mark the rise of the “ruling reptiles”, and may help pin down the humble beginnings of their great dinosaurian cousins. Arizonasaurus, Xilousuchus, and Ctenosauriscus are not household names. (At least, not household names in the homes of non-paleontologists.) Part of the reason why they are not is because these creatures belonged to a peculiar group of animals with no living descendants or even modern analogs. Though crocodiles are their closest living relatives, there is a massive evolutionary gulf between the early Triassic animals and the modern amphibious reptiles. Other than that relationship, there is little that lets us place them in the context of the world as it is today. These were strange creatures. 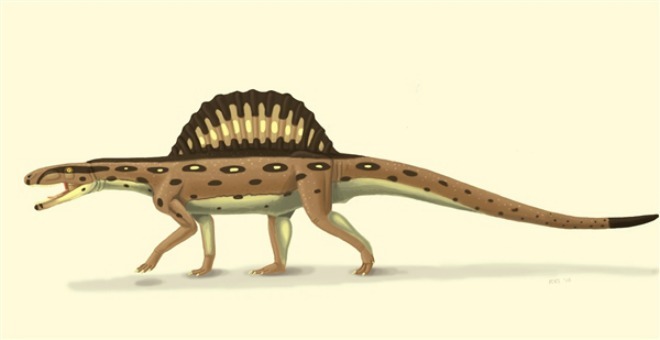 Arizonasaurus and its kin were slender, primarily terrestrial creatures which carried their limbs beneath their bodies rather than sprawled out to the sides. And, of course, there was the sail. Despite their unfamiliar nature, though, paleontologists have recently been able to ascertain the place of Arizonasaurus, Xilousuchus, and Ctenosauriscus in the wonderfully-varied and wildly-branching tree of life. In general terms, the trio of finbacks were archosaurs – the major group of vertebrates represented by birds and crocodiles today, but which historically included non-avian dinosaurs, pterosaurs, and bizarre collection of their close relatives going back almost 250 million years. More specifically, the three-sail backed archosaurs belonged to a varied subgroup along the crocodile side of the family tree called poposauroids, and within that category they composed their own group called the Ctenosauriscidae. What is remarkable is that these bizarre creatures are the earliest definitive archosaurs yet discovered, and they represent the early years of one of the most successful and important evolutionary dynasties in the history of life on earth. The origins and early origins of archosaurs has been a long-standing puzzle. While the precursors of archosaurs were present during the end of the Permian period – a time during which our own distant relatives dominated terrestrial habitats – what paleontologists recognize as “crown group” archosaurs did not originate and begin to undergo their major evolutionary radiation until after 250 million years ago, during the Triassic. (The crown group Archosauria contains the “bird-line” and “crocodile-line” archosaurs going back to the last common ancestor of both groups. To put it another way, archosaurs are birds, crocodiles, and their closest extinct relatives.) Various archosaur body plans evolved rapidly. Even though ecosystems were still undergoing a long period of recovery in the wake of the devastating end-Permian extinction, archosaurs of different types appeared soon after the catastrophe. Just last year, paleontologist Stephen Brusatte and colleagues hypothesized that tracks found in Poland indicate that creatures closely related to the earliest dinosaurs had already evolved by about 249 million years ago. 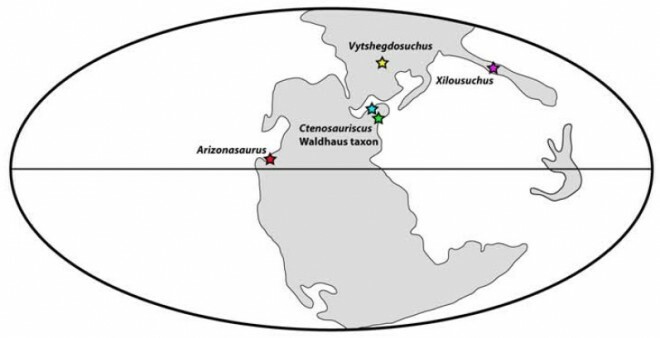 A global map showing the locations of the earliest known archosaur body fossils from the Early Triassic. Red: Arizonasaurus; Purple: Xilousuchus; Blue: Ctenosauriscus. From Butler et al., 2011. The three sail-backed archosaurs also alter the big picture of how archosaur evolution played out. It just took a little while to identify what they truly were. Each was originally described as a different sort of creature – Arizonasaurus and Ctenosauriscus were both bumped around between various groups of Triassic vertebrates, while Xilousuchus was initially thought to sit on a branch just outside the true archosaurs. Through the discovery of better material and the redescription of what has already been found, though, the three were finally put in their proper place. At about 247 million years old, Ctenosauriscus may be the oldest archosaur known from body fossils on record. Arizonasaurus was about a million and a half years younger, and, although its exact age is still uncertain, Xilousuchus was around right about 247 million years ago, as well. But why did these creatures have sails? Elongated neural spines which would have supported a sail appear to be a specialized and shared feature, and it is remarkable that such a characteristic appears among the earliest known members of the archosaur group. I asked one of the authors of a new PLoS One paper on Ctenosauriscus and expert on archosaur origins, Sterling Nesbitt of the University of Washington, what the story behind the sails was. “I have no idea why sail-backed taxa are the earliest clade of archosaurs to appear in the fossil record, so far”, Nesbitt said, but he did point out that “According to our new paper and my other previous papers, all of the sail-backed taxa are closely related so the feature appears to have evolved once (or maybe twice because of Lotosaurus).” Lotosaurus – another sail-backed archosaur – was more closely related to a different archosaur subgroup than to Arizonasaurus and kin, and so its sail probably evolved independently and was not inherited from a common ancestor. A hypothetical dinosauromorph, based upon Early Triassic tracks found in Poland. 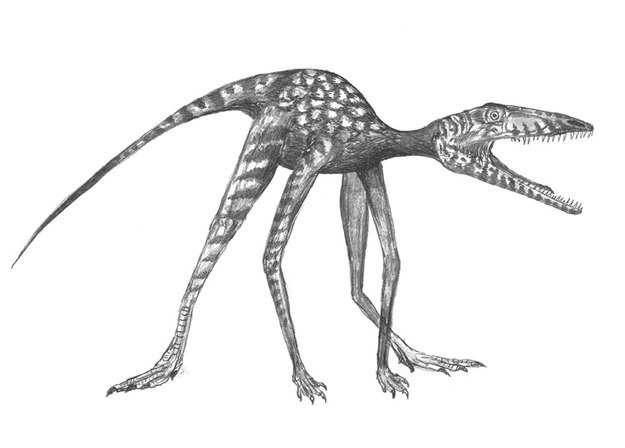 This sort of creature represents what paleontologists expect early, bird-line archosaurs to look like. CREDIT: Grzegorz Nied?wiedzki. While the reason why sail-backed archosaurs evolved remains mysterious, it appears that the origin of these creatures and their kin resulted from the great clearing of the ecological slate which occurred at the end of the Permian. The mass extinction at the boundary between the Permian and the Triassic cleared out habitats and niches the world over, and archosaurs were among the creatures which filled those ecological gaps. “As we find more and more archosauriforms in the Early and Middle Triassic,” Nesbitt pointed out, “it appears that many of these fossils actually are within the crown group. Thus, the diversification of archosaurs and their closest relatives (archosauriforms) appears to have occurred quickly in the Early Triassic given that there is a only a single basal archosauriform (Archosaurus) and few diapsids prior to the Triassic.” What’s more, early archosaurs were undergoing an evolutionary radiation at the same time that their more archaic archosauriform relatives were. Nesbitt explained, “I also think that archosaurs are just part of an archosauriform radiation. Diversification rates of stem archosaurs (non-archosaurian archosauriforms) cannot be differentiated from those of archosaurs in the Early – Middle Triassic.” The more archaic forerunners of the archosaurs were rapidly evolving right at the same time – lineages both old and new coexisted alongside each other. Despite their superficial appearance to some sail-backed dinosaurs, Ctenosauriscus, Arizonasaurus, and Xilousuchus were not closely related to dinosaurs or other “bird-line” archosaurs at all. The three were on the crocodile side of the tree. Nevertheless, the existence of crocodile-line archosaurs so early in the Triassic indicates that the deep split in the group’s family tree already happened. Since crocodile-line archosaurs were already around by 247 million years ago, bird-line archosaurs – including the precursors of dinosaurs – must have already existed, too. “We do not know what these early animals look like,” Nesbitt said, “but they were likely similar to Lagerpeton or Marasuchus.” These small, lightly-built creatures looked vaguely like small theropod dinosaurs, though they were not actually dinosaurs. “However,” Nesbitt added, “the first body fossils of bird-line archosaurs appear at the end of the Anisian (the silesaurid Asilisaurus, Manda Beds),” and the presence of such a creature with a number of specialized features at this time mean that “the bird-line archosaur radiation must have been well underway by the end of the Anisian.” Paleontologists have yet to find the earliest archosaurs of all, and the roots of the family tree are still obscure, but the earliest representatives of each group yet found hints that the “ruling reptiles” rapidly evolved in a world devastated by the worst mass extinction of all time. Top image: A restoration of Xilousuchus. Image credit: Sterling Nesbitt.